About a million years ago, I was flipping through cookbooks, looking for something simple and hearty to make. 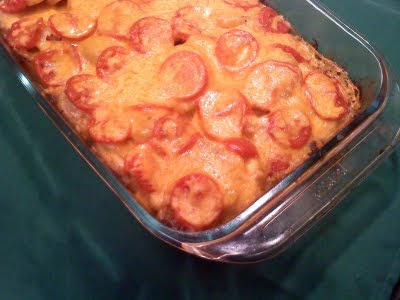 I found a recipe that had layers of potatoes and onions and tomatoes. It sounded good, so I gave it a try. To be honest, I thought it was pretty good, but it seemed to be missing something. It was kind of dry and not very flavorful. I had forgotten all about that recipe until a few weeks ago when I was watching an episode of Everyday Food. They made a decadent potato gratin, with lots of goat cheese and heavy cream. I thought AHA! Maybe I can put the two recipes together, and come up with a new and fabulous dish! And that's exactly what I did. I reduced the amount of heavy cream, changed a few of the ingredients, and tweaked the cooking method. I'm so pleased with how it turned out! It's rich without being too heavy, and it's so tasty! It's perfect as a brunch or dinner entree. In a large heavy pot, heat olive oil over medium heat. Peel and thinly slice onions. Add to the pot. It seems like quite a lot of onions, but don't worry. They really cook down to a much smaller volume. Being careful not to burn, slowly caramelize the onions. Be patient! This will take about 10-15 minutes. Using a wooden spoon, stir the onions quite often, scraping up the browned bits from the bottom of the pot. In the meantime, peel the potatoes and slice them into 1/4 inch slices. Place the potatoes in a large casserole dish. Position the slices so that you have an even layer. Sprinkle with salt and pepper. Spread caramelized onions evenly over the potatoes. Slice the tomatoes into slices and arrange them in an even layer over the onions. Sprinkle with Italian seasoning and a pinch more salt and pepper. Pour the cream over all. Cover with foil and place in oven for about an hour (or until potatoes are tender). Remove from oven. Sprinkle with cheddar cheese. Place back in oven (uncovered,) for 10-15 minutes, just until the cheese is melted and bubbly. The first time I made this, I added garlic to the dish, but this is one of the few cases where I wouldn't add a lot. Usually, as far as I'm concerned, more is more, but I found that too much garlic is a little overpowering in this particular recipe. You can add a layer of cooked chicken, if you like, but it really doesn't need it. It stands beautifully on its own, just as it is. Serve it with a lovely green salad and you're good to go!